You can have one of two experiences at Pies 'n' Thighs, that of a "regular" meal, or go on the weekend for brunch all afternoon. Each one is as satisfying as the other, but the full menu has more to choose from, and I would probably go back more for the sides anyways. Don't get me wrong, the fried chicken is definitely good. It's keen to center your meal with a fried chicken box ($12.50, below). It includes three pieces of their specialty, as well as a slightly dry and extremely buttery biscuit and one side of your choosing. The mac n' cheese has a splash of hot sauce and is very creamy, almost sticking to the sides of your throat, not a bad thing in my book. The staff is rather gruff and grumpy, but I think they might just need an extra hand or two and are always busy running around. I would be grumpy too. Once you do get your food though, you need nothing but a set of silverware and some napkins. Under the specials list on the menu is the fried pickled cauliflower ($5, below) which is an appetizer made in heaven. It makes a wonderful way to start your meal, if it does come out first, the pickled vegetables get your mouth watering for everything else still to come. Another way to sample more, besides inviting all your friends, is to grab the superbowl ($10, below), three sides of your choice and a piece of cornbread or biscuit. Come on a weekend morning or afternoon and find yourself with the brunch menu in your hands, served until 4pm. If you're super hungry, grab a donut ($2, below) to start. 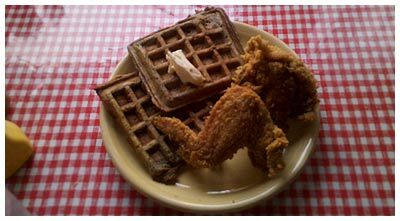 There are a few southern specialties on the menu, but it only seems most practical to go for the chicken & waffles ($10, below) if you are only here once. The waffles are good enough to eat on their own and do not need to be smothered in butter or syrup. The chicken seems just a tad less fresh in the morning, oddly enough, but this might just be my experience.